The music in this album is that of Eddie J. 'Son' House, Jr., and it represents the payment of a debt. It's a debt owed to bluesmen born too early to have been recorded, and to the later great ones who sang their songs alone, without benefit of recording studios or microphones. Son House was one of the lucky ones. He recorded nine skies for Paramount Records in 1930, and, of these, only four ('Preaching the Blues' and 'My Black Mama,' both in two parts) have ever been found. The others were 'Dry Spell Blues' ffwo parts), 'Clarks-dale Moan,' 'Mississippi County Farm' and 'What Do You Want Me to Do!' If you find one, baby, call me collect day or night. During the 1930's he worked as a tractor driver in Robinsonville, Mississippi, a wide spot on a dirt road that parallels Route 61 about twenty miles south of Memphis. Son recalls an incident in 1936 or 1937 while he, Willie Brown and a harmonica player named Leroy were having an impromptu session. A car stopped and a man jumped out and quickly assembled his recording equipment and microphones. He taped three or four songs, packed up his gear and drove away without asking for any names or song titles. It must have been a talent scout for Major Bowes. Not until 1942 did Alan Lomax, the peripatetic man with the tape re-corder. find him there and record him for the Library of Congress. Son moved to Rochester, New York, in 1943 and worked as a porter on the New York Central Railroad, a grill cook for Howard Johnson's, and shaved the hair from dogs and cats to prepare them for veterinary surgery. He stopped playing the guitar in 1948 because the post-World War II generation didn't want to hear the old blues anymore. Music had to move, man. It had to jive, jump, step, plug-in-that-amp-baby, go, go go! Son House listened and said to hell with it. A man's got his pride. He quit. On a June evening sixteen years later, three young white men came to 61 Greig Street in Rochester and ended a search of three weeks and nearly 4,000 miles. They played tapes of his 1930 records and told him that there were once again people who would listen. Could he? Would he? The same pride that made him stop playing now made him want to start again. It took a unique kind of personal courage. The old songs started to come back and, with them, the driving style, the flashing metal slider across the strings, and the voice, the voice—the same low melancholy an-guish flared with spontaneous falsettos. And so Son House returned from his self-imposed limbo. People call him 'legendary,' but he isn't—not in any awesome sense. He likes his eggs over easy, his bourbon straight, and when an order of fried chicken is too big, he wraps the extra pieces in a napkin and takes them home. Son is quiet in a diffident manner, painfully polite and he still says 'Thank you' when he signs an autograph. Yet he is nobody's Uncle Tom. He was taking an early morning walk along the beach at Malibu when a lady called the police and said an old colored man was looking at the houses. The law came and wanted to know who and what and why, so Son told him who and what and why and a few other things, too. In the course of Son's recent appearances across the country. we met a lot of good people, and they've all done something to help. They were good people who didn't ask for anything, but just helped and helped. Son remembers the tall, blonde girl with the wide smile who was kind and sincerely concerned when he was sick during the 1964 Newport Festival. He has never met the two bearded young men, Peter and Paul, with whom she sings, but he remembers Mary, 'a good person.' And he remembers Judy Collins, who stood beside him backstage at the Philadelphia Folk Festival that August. It was his first appearance in a long time and he was nervous, but she told him he'd do just fine, and he did. If anyone made Son's return possible, it's Al Wilson. He's the best bluesman ever born with white skin, and if you don't believe me, just ask Son or Skip or Sleepy John or Bukka or Robert Pete, because he has played with them all. They listen to him and then they smile and reach for a guitar and he moves them and makes them better. 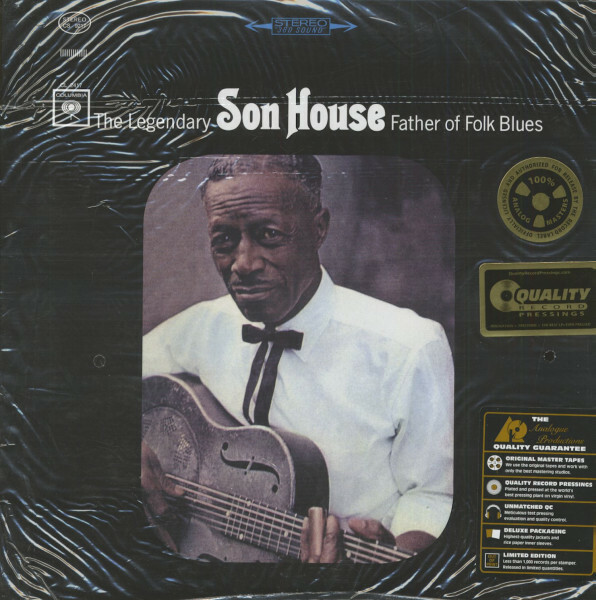 When Son first heard Al play the old Son House songs, it rolled back empty years and blew the dust from his memory. In this album, Al plays second guitar on Empire State Express. and together they drive and build intensity until it climaxes in a triple ending that left the studio audience limp. Al's harmonica backing on Levee Camp Moan is a quiet masterpiece of subtle taste. His notes tumble a slow cascade down a waterfall of music along with the guitar, and Son smiled and knew he was there. And thank you to George and Paul and John and Ringo, and Mick and Brian and The Supremes, and The Righteous Brothers, and Bobby—especially Bobby—because they're bringing it all back home and that's where it belongs. Because when it gets there, Son House will be waiting, waiting and knowing because the man has paid his dues and probably paid a little bit extra for all of us, too. 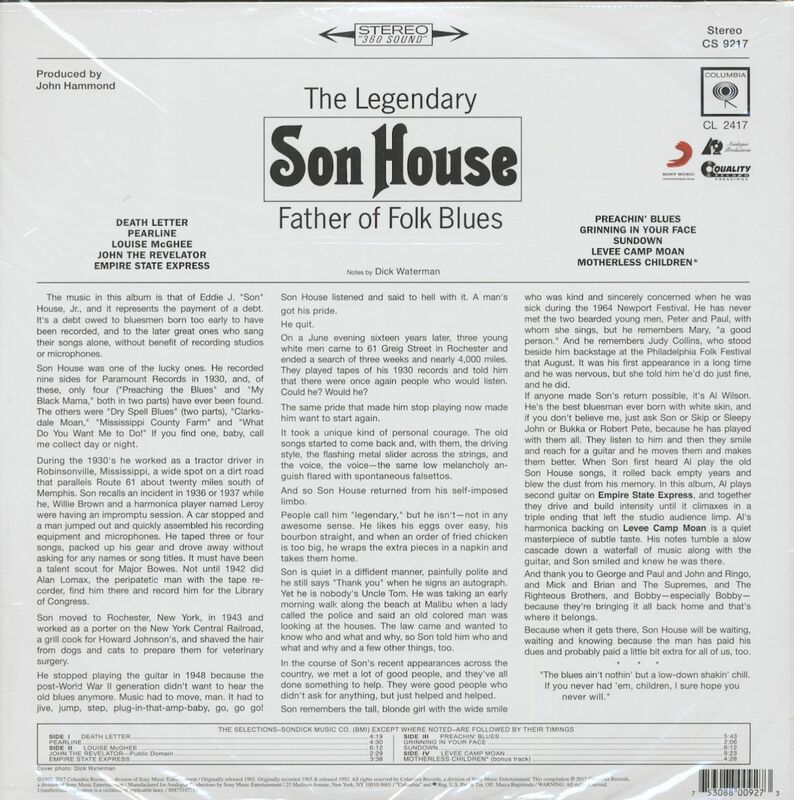 Customer evaluation for "Father Of The Delta Blues (2-LP, 200g Vinyl, Ltd.)"